NEW BRITAIN - As the fall season comes to a close, individual players are stepping up to try and salvage their chance to make it as far as they can in the postseason or at least finish the year out on a strong note. Every team has those players you can rely on to get the job done. This past week Southington’s Natalie Verderame and Plainville’s Frank Griffin proved to be those athletes. Verderame’s goal two minutes into the first half led the Southington girls soccer team to its 1-0 victory past Hall, and its advancement to the second round of Class LL tournament last Tuesday afternoon. It was the first time the Blue Knights had advanced past the first round of the tournament since 2008. But Southington fell to No. 7 Ridgefield in the second round 2-1 last Thursday, ending its season with a 12-3-3 mark. Although the Blue Knights didn’t make it beyond the second round, Verderame was one of the main reasons they were able to make it as far as they did. The Blue Knights offense controlled the possession of the ball the entire first half. But, it wasn’t until junior Kelly Dolye fed the ball to Verderame and allowed her to find the back of the net. Southington was then able to hold the one-point advantage for two, 40 minute halves. The Plainville football team overcame a tough back-and-forth battle against Avon on Saturday. And in the end, the Blue Devils were able to walk away with their fourth consecutive win, 28-21, with the help of Griffin. The dual threat quarterback lead the team through the air and on the ground as Griffin was responsible for 24 points of Plainville’s points. He completed 8 of his 15 passes for 145 yards and two touchdowns, while also carrying the ball 13 times on 59 yards with two more touchdowns. His ability to pass and run the ball gave Plainville the dimension they needed to overcome the Falcons. One of Griffin's passes went for 55 yards to Brady Callahan for the first touchdown of the game just two minutes in. “Frank has grown a lot since last year,” Plainville head coach Tim Shea said. “He has a much better grasp on the offense and is more comfortable in running it. As he has gotten older, we have put more on his plate, and he has responded to each and every challenge. We are looking forward to finishing this [season] out. The Blue Devils have one game left in their regular season until the playoffs start. This week Plainville will have a bye week before they see Farmington for their finale on Thanksgiving. Griffin and the rest of the Blue Devils will take this time to work on the little things to make sure they come out on top with the winning season that they want. Plainville is currently 5-4 on the season. 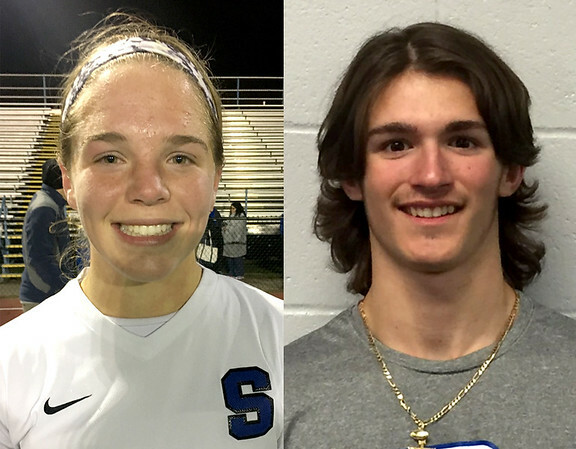 Posted in New Britain Herald, Athletes of the Week, General Sports, Plainville, Southington on Monday, 13 November 2017 22:15. Updated: Monday, 13 November 2017 22:17.